While I was editor of the high school paper, we won journalism awards while the football team had a losing season. I even dated the head cheerleader. But for some reason, working with good-looking, good-smelling girls was not as “manly” as tackling other guys, then taking a shower with them. Well . . .
1. We believe it’s okay to prefer good-smelling women to sweaty men. 2. We believe it’s okay to be brainy rather than brawny. 3. We believe it’s okay to excel in a career that lasts longer than our knees or throwing arm. 4. We believe it’s okay to spend our time with family and friends rather than the TV, bar or arena. 5. We believe it’s okay to spend our money on the needy rather than on million-dollar athletes. 6. We believe it’s okay to spend time with a good book than a play book. 7. We believe it’s okay to not belong to our club. 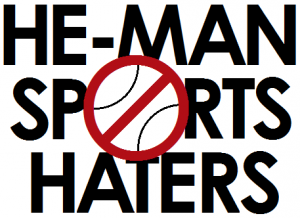 It’s okay if you love sports—just don’t judge our “manhood” based on our choices. Join today! Just leave a comment below to become a member.